Join naturalist Mike Patterson for an early-morning birdwatching walk at Circle Creek Conservation Center. Habitats here range from creek and river corridors to shrub-scrub and sedge-dominated wetlands and forest wetlands dominated by Sitka spruce. As a result, we may see a wide variety of birds, ranging from songbirds to bald eagles and other raptors. 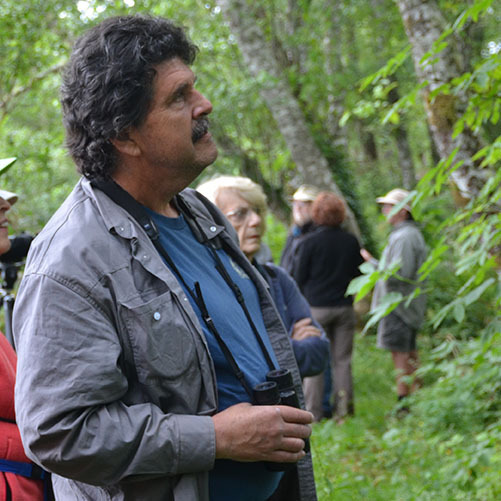 With his keen eye and ear, Mike will help you spot birds and identify and better understand the trees and other plants and animals that characterize this habitat reserve. Everyone is welcome, from first-timers to experienced birdwatchers. MIKE PATTERSON is a biologist, educator, and professional counter of things—birds, butterflies, moths, flowers. “The goal is to take these disparate bits of data, stitch them together, and find some portion of the ecological whole,” he writes. Mike lives in Astoria and blogs about birds and more at surfbirds.com/community-blogs/northcoastdiaries. Walk info: We will be walking on mostly level footpaths that range from mown pasture to old gravel roads and may include footbridges and boardwalk, which can be slick if wet. Footing may be uneven in places. No toilets on site. Please leave dogs at home. What to bring: Water and snacks. Please wear sturdy walking shoes and dress for the day’s weather. Bring binoculars if you have them. This program is free, but registration is required. North Coast Land Conservancy shared a link.